1. What is stainless steel ring? 4. How to care for stainless steel rings? WHAT IS STAINLESS STEEL RING? Stainless steel is an iron and carbon alloy that injects different metals to resist discoloration, rust and corrosion, and to increase strength. Chromium, nickel and manganese are often used in stainless steel alloys, and each component has a slightly different effect on the appearance and strength of the resulting metal. Stainless steel is usually marked with a pair of numbers. These figures refer to the chromium and nickel content of the steel. For example, a stainless steel ring labeled "20/12" contains 20% chromium and 12% nickel. The higher the numbers are, the more resistant the steel is to rust and corrosion. In order for the steel to be considered stainless steel, it must contain at least 12% chromium. Chromium prevents steel from rusting and corroding steel surfaces by creating an invisible top layer, thus making steel stainless steel. This means that stainless steel jewelry will not rust or lose its luster. Stainless steel metal was just used for flat tableware early. It has become popular for its strength, durability and economy. Today, stainless steel is used in a variety of industries and has become a popular choice for men's rings because of its attractiveness, low cost and durability. Stainless steel straps are very popular because stainless steel jewelry can last a long time. Stainless steel jewelry is durable and rust-proof. It usually has a silvery luster, but unlike silver, it does not corrode and is not susceptible to scratches, bites or dents. Stainless steel can be used to make almost any type of jewelry, from rings and bracelets to necklaces, watches and earrings. 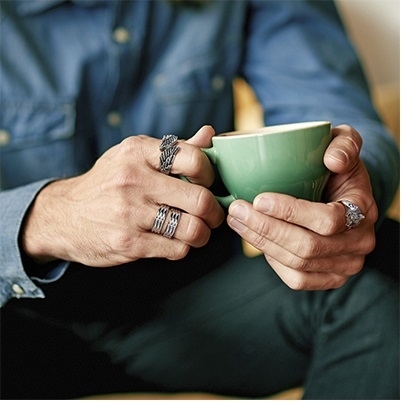 For rings, rings made of stainless steel are a smart choice for everyday wear because they are durable and strong. Stainless steel is a very strong metal. It has incredible strength and scratch resistance, making it ideal for people with occupations or hobbies to damage softer metals. If you are looking for accessories that resist scratches, dents and damage, the stainless steel ring is great. Your stainless steel ring may retain its original shape and shine for a lifetime, no matter how much abuse your work, hobbies or other activities require. Due to its use in the industrial sector, stainless steel has always been associated with a strong masculine gas phase. Stainless steel is a particularly popular choice for men's wedding rings. If you are buying a wedding ring but want something that looks tough and strong, then you should consider using stainless steel. Stainless steel rings are also a good choice for women who want a masculine ring. Stainless steel is a hypoallergenic alloy that is ideal for people who are allergic to precious metals. They can be cleaned with warm water and dishwashing detergent to keep them in top condition. They can be polished with a soft cloth. After years of wear and tear, the stainless steel ring may lose its original luster. Professional polishing can restore the original shine of the ring. Steel rings are more environmentally friendly than many other metals. Compared to other metals, they produce less waste and consume less energy. Stainless steel rings are also an environmentally friendly choice for green wedding rings. Stainless steel is produced with less waste and energy than other metals, and stainless steel is also 100% recyclable. In addition to high durability and resistance to scratches, corrosion and tarnish, stainless steel rings are also very affordable. Because it is not a precious metal, such as gold or silver, making stainless steel parts very economical. Although these rings have a platinum appearance, they are priced at the same price as titanium and tungsten rings. If you are looking for a cheap wedding ring or a discounted men's wedding ring, the stainless steel ring offers a low price without compromising quality. The steel ring cannot be resized or repaired. Since the stainless steel becomes so hard after it becomes a ring, it becomes impossible to adjust the size. So it's much better to give the right size when ordering a stainless steel ring. But you don't need to worry about this, findurings.com offers free size exchanges for all rings. The Achilles heel of stainless steel rings is chlorine. Stainless steel is very sensitive to chlorine and any stainless steel rings should be removed before swimming in chlorinated water. HOW TO CARE FOR STAINLESS STEEL RINGS? Despite the durability of stainless steel, it does require some specialized care to ensure it stays beautiful on the wedding day. Although stainless steel jewelry does not discolor or corrode, it does not require special care, but it may scratch your other jewelry. You can put them in a pouch or bag before putting them in the jewelry box. If you don't have one, you can use a soft tissue or a small zip pocket. You can easily clean stainless steel jewelry with stainless steel cleaner or detergent, water and a soft cloth. You can buy stainless steel cleaners in most department stores or buy them from online stores. Or you can make your own cleaning water. Take a plate of warm water and pour a few drops of mild dishwashing liquid. Then take a lint-free cloth, immerse the cloth in water. Remove the cloth from the water, gently wipe the surface of the jewelry, and hold it firmly in your hand. Once you have wiped with a mild dishwashing liquid, bring a plate of warm water and then immerse the jewelry in it for rinsing. Finally, before wiping with a clean, dry cloth, make sure there are no air bubbles or soap residue on the ring. If the brilliance of the jewels has not yet recovered, it is time to use a stainless steel polish. You can do this from time to time to get the luster of stainless steel. After gently wiping with a polishing agent, rinse thoroughly, as polishing wax may irritate the skin.